A new hero emerges in a divided world as one of sci-fi’s most beloved series–Anne McCaffrey’s Dragonriders of Pern–relaunches with this original adventure from Anne’s daughter, Gigi McCaffrey. I’ve been a huge fan of Anne McCaffrey’s Dragonriders of Pern series ever since I stumbled across them at the bookstore across the street from my house when I was a teenager. While my love of fantasy and science fiction may have already been well established by that time, the Pern books had a huge impact on how I felt about dragons in the genre and I’ve never really been able to find anything that I think comes close to the Pern books. As much as I love the series I wasn’t a huge fan of the Pern books Todd McCaffrey wrote. He’s a good author but his Pern books didn’t feel like they really fit in with the series to me. So I approached Gigi McCaffrey’s book with a bit of hesitation, though I was still hopeful for a great book. The problem I have with reviewing a book like this is its always so difficult not to compare any of the newer Dragonriders of Pern books with the originals which just isn’t fair to Todd or Gigi. So I was honestly a bit surprised with how well Gigi McCaffrey did in matching the tone and feel of her mother’s books while still making the story and it’s characters her own. Dragon’s Code was one of those books that I enjoyed so much I was unable to stop reading it once I had started and there were honestly a few times where it felt like this was something Anne McCaffrey herself could have written, which really impressed me coming from a first-time author. 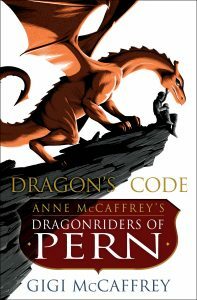 Pern is one of my favorite fantasy worlds to return to and I thought the world in Dragon’s Code was as beautiful and richly detailed as it’s ever been and the characters were fantastic. Piemur has always been one of my favorite characters in the Pern books and I thought Gigi did a great job expanding on his character and showing what he would be like as he aged and changed as a person. He’s always been one of those characters that I wanted to read more of and I’m happy he’s one of the main characters in this book. It’s always good to see familiar faces who were kind of pushed to the back take center stage once again. I do have to say though that I thought the dialogue was a bit rough and ridiculous at times and the author was a little too free with the random info dump. I mean I understand that there is a lot of background information that she wanted to fill in with this book so new readers didn’t have to read the entire series to enjoy it but I don’t think it was very well done. It took away from my enjoyment of the book whenever it happened. That being said, I still found this book to be beautifully written full of great characters that were a lot of fun reading about. I can’t wait to see what Gigi McCaffrey has next in the series but I know the wait is not going to be an easy one. I will happily recommend this book to anyone looking for something to read, and can honestly say that while it would help to read the original books first, Dragon’s Code makes a pretty solid jumping off point for new readers.